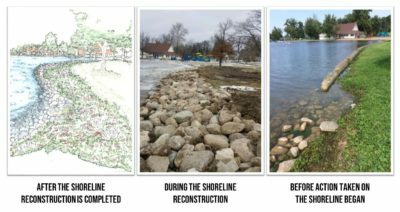 The Watershed Foundation’s reconstruction of 500 feet of Winona Lake’s Limitless Park shoreline began this winter, following months of an intensive public education campaign. Two main health and safety issues affecting the park will be fixed with the engineering of this project. According to the U.S. Centers for Disease Control, exposure to goose droppings can cause diarrhea, urinary tract infections or respiratory illness. 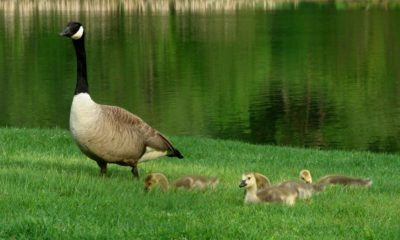 Goose droppings can also contain salmonella and other germs that cause gastrointestinal issues. Large numbers of geese leave large quantities of feces. A single goose can defecate every 20 minutes and can produce up to 1.5 to two pounds of feces each day. The best way to combat both geese, and the undercut erosion occurring under the current seawall is by installing a healthy shoreline with a mix of glacial stones and native plants along the 500 linear feet of shoreline from the edge of the public swimming beach to Cherry Creek. An EPA model calculates that this shoreline project will stop the erosion and resuspension of 31.5 tons of sediment and stop 26.8 pounds of phosphorus from polluting Winona Lake. These steps will also reduce the growth of weeds and algae by 268,000 pounds per year. In combination with this construction project, The Watershed Foundation invested in the education of park users. 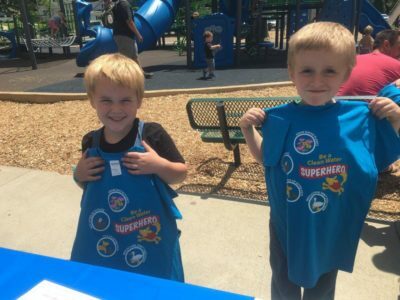 “Our awesome volunteers spent the summer educating park visitors, especially youth, about not feeding the waterfowl and other actions they can take for clean water, like cleaning up pet poo, picking up litter and growing native plants through two fun activities; making native seed bombs and crafting action pledge bracelets,” said Crighton. 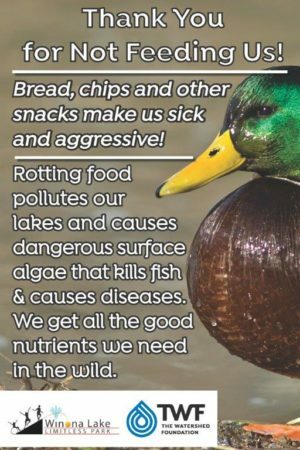 Along with the youth education programs, TWF designed “Thank You for Not Feeding Us” waterfowl signs for the park to discourage this behavior. 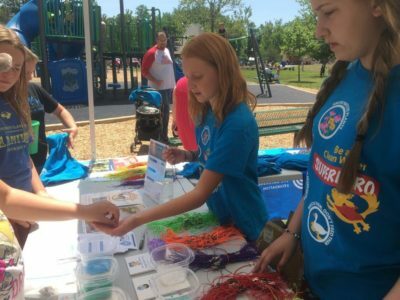 Youth education activities about clean water were held at Winona Lake park. Feeding the geese not only attracts them in higher numbers, but increases their feces, encourages aggressive behavior and makes them sick. “We believe that this three-prong approach, of educating youth, reminding park visitors with signage, and engineering better shorelines, will make an almost immediate dramatic change in the park,” said Crighton. “All of this was only possible because of our amazing partners: IDNR Lake and River Enhancement (LARE) program, Kosciusko County Community Foundation, K21 Heath Foundation, Kosciusko Leadership Academy, Lilly Center for Lakes & Streams, NIPSCO, Arrowhead RC&D, Kosciusko County Convention, Recreation, and Visitors Commission (KCCRVC), Kosciusko Leadership Academy, Town of Winona Lake Parks Department, and the Winona Lake Preservation Association.